kmg02 bought reward: "March 2019 technical challenge: Suspended 4 and 2 chords"
Linda bought reward: "Peerie Joel's Waltz"
Lee bought reward: "Peerie Joel's Waltz"
HarpSmiles bought reward: "March 2019 technical challenge: Suspended 4 and 2 chords"
Lee bought reward: "March 2019 technical challenge: Suspended 4 and 2 chords"
chanikk@aol.com bought reward: "Peerie Joel's Waltz"
Linda: are you playing some of melody close to sound board? HarpSmiles bought reward: "Modes handout"
mezzotara: I love how relaxed you keep your left hand. Are you fitting in damping? How? bought reward: "March 2019 technical challenge: Suspended 4 and 2 chords"
Leonyasf: Ah! I have an old copy (from last year) without intro. I meant measure 7&14 of the tune itself. julia Haines: Thank you for sharing about marking the strings for harmonics. Evelyn: is that a harp figurine on the bottom shelf behind you? Lee: Thank you...this was wonderful! Evelyn bought reward: "Parking spot (exercise and arrangement)"
Lee bought reward: "Parking spot (exercise and arrangement)"
livgc bought reward: "Parking spot (exercise and arrangement)"
harpdog: See you tomorrow i n Richmond. Will you be giving out Peerie's Waltz? Apiarist: Thank you so much! Linda bought reward: "Parking spot (exercise and arrangement)"
mezzotara bought reward: "Parking spot (exercise and arrangement)"
Piprgrl bought reward: "Parking spot (exercise and arrangement)"
GlendaU bought reward: "Parking spot (exercise and arrangement)"
Christine Morphett bought reward: "Parking spot (exercise and arrangement)"
maevegilchrist: And of course - any other thoughts you have are welcome too. See you May 5th!! mezzotara: I like the East coast Sat. 4pm. maevegilchrist: I'm so happy to back in NYC for a bit! melodycooper bought reward: "Technical challenge: voicings (Sep 2018) "
melodycooper bought reward: "Technical challenge: basic finger strengthening (Nov 2018)"
melodycooper bought reward: "Wondering Minstrel jig (intermediate/advanced)"
melodycooper bought reward: "Four note arpeggio combination"
melodycooper bought reward: "Parking spot (exercise and arrangement)"
melodycooper bought reward: "Trip to Ireland (arrangement and harmony)"
melodycooper bought reward: "ostinato exercise hand out (for harpists) and etude." Apiarist bought reward: "Parking spot (exercise and arrangement)"
Will G bought reward: "March 2019 technical challenge: Suspended 4 and 2 chords"
Will G bought reward: "Parking spot (exercise and arrangement)"
bought reward: "Parking spot (exercise and arrangement)"
I learn something new every time. Your explanations move so fluidly among the skill levels (as do your fingers among the notes), it's beautiful to hear and see. What was your favorite part of the performance? It was wonderful. How to I get the music I paid for/claimed during this class? What was your favorite part of the performance? Did not see the performance. Provided a donation, did not get a "ticket", spent at least 35 minutes trying to figure out what was going on. Would like my credit card credited back for my payment. Last month did not progress like this. What changed???? You are endlessly helpful, deeply knowledgeable, and your love of the instrument shines through. Participating in the comfort of home, easy to communicate thoughts and questions. Video is great! Liffey banks sheet music (reel). Advanced. Tune tips for dexterity (triplets and thumbs) All levels. Ostinato exercise hand out (for harpists) and etude. Practice bootcamp handout: shape your practice! A handwritten arrangement of any tune or song of choice! 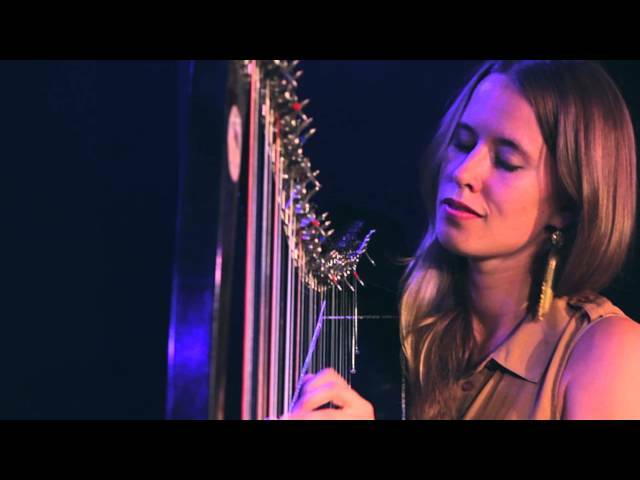 Born and raised in Edinburgh, Scotland, and based in Brooklyn, New York, Maeve‘s innovative folk-jazz fusion approach to her instrument stretches its harmonic limits and improvisational possibilities. She is as at home playing with a traditional Irish folk group as she is with an American string band or a contemporary ensemble. She tours internationally as band leader or soloist and has appeared at such major music events as Celtic Connections in Glasgow, Tanglewood Jazz festival, the World Harp Congress in Amsterdam and the opening of the Scottish Parliament. She has played with such luminaries as Kathy Mattea, Esperanza Spalding, Tony Trishka and Alasdair Fraser. Maeve has released four albums to date, including her most recent recording, 20 Chandler Street, on Adventure Records, with bassist Aidan O’Donnell and fiddler Duncan Wickel, while on her own label her solo Ostinato Project is a beguiling exploration of the possibilities of her instrument. She also maintains a widely acclaimed duo project with percussive dancer Nic Gareiss and tours regularly with bluegrass fiddle ace Darol Anger. Maeve also teaches widely, and is the first lever harpist to be employed as an instructor by Berklee College of Music in Boston, where she graduated. She has written several instructional books published by Hal Leonard Music.